SwordSearcher provides several methods for learning how the Bible interprets itself. One of these is a search tool called Find Related Verses. 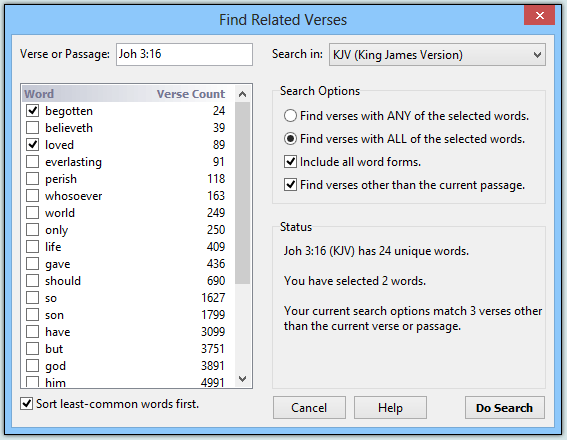 The Find Related Verses search tool provides a simple and fast way to look for verses containing the same or similar key words of a passage. 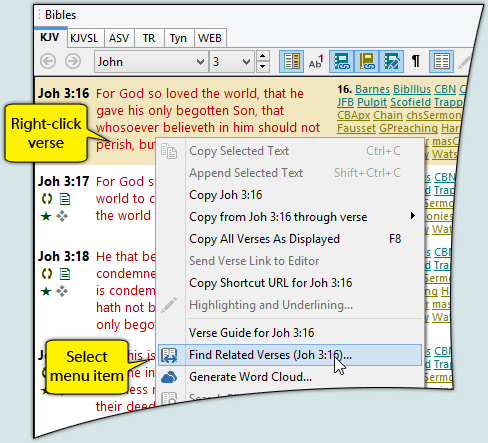 Instead of manually typing each word that interests you into a search box, the Find Related Verses tool helps you select them from a list and shows you how uncommon each word is, making it easier to identify the unique concepts of the verse. You can also select "Find Related Verses" from the Search menu. At the top-left, I can specify a verses or passage. In this case, John 3:16 is already filled in because that is the verse I right-clicked. Below that is the word list. Notice that the word list is sorted so that the least-common words in the Bible appear first. A verse count is also shown for each word, so I immediately know how often a word is used in Scripture. The check boxes next to the word tell SwordSearcher which words I want to look for. In this example, begotten and loved have been selected. To the right are the Search Options. "Find verses with ALL of the selected words" has been selected, because I want to see other verses using all of my key words. I have also checked "Include all word forms." 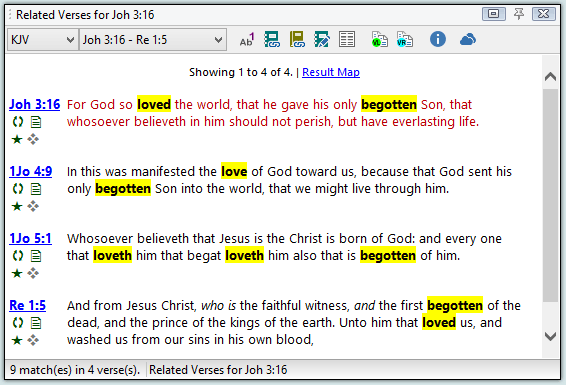 This is important to me because I want to find verses that use any form of the word "loved" along with "begotten." At the bottom-right is the Status area. It tells me about the search and is updated on-the-fly as I change options. This makes it easy to see how refined my search is. If my selections return too many verses, I can easily change settings to narrow things down without having to commit the search. In addition to the verse I am studying, I have found three wonderful cross-references. Note that even though the original key word "loved" was selected, I still see verses that use the word "loveth" and "love" because I selected the Find All Word Forms option in the search. This way I don't miss out on verses that have similar words. Although SwordSearcher already includes an excellent set of cross-references, the value of personally discovering your own cross-references during a targeted study can't be over stated. Scripture is its own best interpreter, and using a tool like the Find Related Verses search helps you allow the Bible to interpret itself for you during your own study.